Many ‘defining’ moments in life come from having crucial conversations (as these create significant shifts in attitude and behaviour). This book focuses on techniques on how to hold such conversations in a positive space when surrounded by highly charged emotions. Their findings are based on 25 years of research with 20,000 people. Our success in life is dictated by the quality of relationships we can engender. Some people seem better at negotiating better quality outcomes (for all) than others do – they work with people rather than through people. They are able to hold deeper, more honest conversations that create a new level of bonding and are able to transform people, situations and relationships. By being prepared to hold these conversations (often early) they ensure clarity over responsibility, define expectations and hence maintain high levels of performance. When we let these conversations go by, we let standards slip and unwittingly give permission for unwanted behaviour to continue. Crucial conversations lie all around us – all the time: from performance appraisals at work, up to discussing problems over sexual intimacy. The skills we need in the boardroom are the same skills we need in the bedroom. Notarius & Markham (two marriage scholars) examined couples in the midst of heated rows and found people fell into one of three behaviour camps: Those who get emotionally drawn in and resort to threats/name calling; Those who silently fume; and those who speak openly, honestly and effectively. Upon analysis they found those in the third camp were more likely to stay together. Furthermore, a study by Kiecolt & Glaser on the immune systems demonstrated that those couples who routinely failed in conducting successful crucial conversation had weaker immune systems than those who resolved their issues effectively. When communities have been studied they found that it was not necessarily those communities with the most problems which were dysfunctional – but those communities that dealt with the issues inappropriately. Communities that embraced the issues and discussed in open honest dialogue were ‘healthier’ than those who either tried to control or ignored them. Crucial conversations, by their very definition are important and can affect a person’s life. There are three factors that tend to define a crucial conversation: 1) Opinions differ 2) The stakes are high and 3) Emotions are high. If handled properly they create breakthroughs. If handled badly they can lead to breakdowns. Whole relationships can hang on how these are dealt with. And the reality is many people do not deal with them well – or at all. They live in either a sub-optimal state or hope the situation will resolve itself. 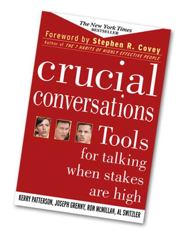 This book outlines a process that leads to greater success at holding critical conversations. Where you come from dictates where you will get to. How we discuss something is often the real issue rather than what we are discussing. Thus we need to be in the right place ourselves and create the right space for the other person. So first we need to manage our emotions and mindset. If we approach the situation with the wrong emotions and mindset and enter a conversation in a place of anger, resentment and revenge (having already made up our mind about someone), it is unlikely to end the way we need it to. Instead, we have to start with a positive intent and good-will for the other person. It’s difficult to change another person but easier to change yourself. So the first principle of dialogue is to start with ourselves. We often see the issue to be with the other person, but we are also culpable. For example we often play games in relationships (e.g. ‘Salute and stay mute’, ‘Freeze your lover’ or ‘Martyr’), hiding behind sighs, raised eyebrows, hints, sarcasm or innuendo rather than confronting the issue. And when we do decide to act, we lurch to the other extreme, leading to hyperbole, overly directive and didactic communication (where we do not listen). Both extremes fail. Thus, we need to enter the conversation being ‘open’. Our unique past experiences are bought to bear on any situation we find ourselves in – and this unique past creates meaning of that event. Hence it’s critical not to assume that our view is the only truth – after all, we may be wrong! We must therefore ensure we understand the differing perspectives/meanings people have of an event in order to hold an effective debate. Furthermore, we need to maintain a place of mutual respect. Realistically the only way to remain in conversation is to be authentic. Our verbal and non verbal communication will play witness to the truth (something the other person will often unconsciously sense). But how do you feel respect for a person that we don’t respect? Often feelings of disrespect come from focusing on what’s different from us. To build a level of respect we need to instead focus on areas that they are similar to us on. We all have weaknesses and it’s a case of accepting that their weakness is no weaker than our own (cf the witticism caught in this prayer: “Lord, help me forgive those who sin differently than I”). The key to critical conversations is to always stay in dialogue – If the lines of communication go down, then there is no hope for a resolution. Only when we are talking can we get all the relevant information out in the open and this requires a 2 way flow of information. We need to make a person feel ‘safe’ The safer they feel, the more likely they are to open up. The greater their fear the more likely they will either close down or fight back. Closing down can take one of three forms: Masking (where we pretend to agree/be listening etc); Avoiding (distraction techniques); and Withdrawing. Being in a high risk conversation (or any conversation for that matter) requires total sensory acuity – we need to be awake to all the nuances that are taking place (the faster you spot them, the quicker you can adapt). Dealing with people is not about having a fixed plan – we need to keep the end in mind and be flexible, addressing the issues as they emerge through the dynamic exchange. We get so drawn into the conversation we may miss the bigger picture – we focus on the words and fail to read the cues around us. Three key areas to look for: When the moment a conversation turns crucial; Signs that the other person does not feel ‘safe’ and also being aware of own style under duress (Examples for all of these include our own feelings, plus for them a tightening of eyes, change in energy and language and tone). Thus we need to be triple processing: Content, Context and Self. This often involves self-observation – as if we were watching another person. When one senses a situation is becoming unsafe, we need to step out of the conversation (and not get caught in the game that is now in play) and instead keep focused on the end desired outcome. If we stay ‘in content’ to try to fix the safety issue then all we do is water down what we were going to say (so fail to achieve the cut-through that was required). We need to instead focus on the context. Often people have taken what’s been said and created a negative meaning out of it. This needs to be addressed often by merely restating your positive intent. For example “Can we just switch gear for a minute? My goal here is not to make you feel guilty. My intent is purely to help us both find a way through this together”. We re-establish safety primarily by listening. We need to demonstrate that we are willing to listen openly and respectfully to them. This can only be done from an authentic place of compassion and curiosity. Critically we need to encourage them to tell us everything. Sometimes we want them to ‘back-fill’ the story as a way of understanding where the issue ultimately stems from (as the saying goes, ‘every sentence has a history’) Hopefully, the more you ‘pull’ from them, the more their emotions will subside. Furthermore, having listened carefully to them, they are then more open to listen to us. Paraphrase (to acknowledge their story). The key here is to stay out of emotions and use their language as much as possible . We might start this off with a phrase like “Let’s see if I have go this right….”. The area we most want to cover are the meanings they have put onto things. Prime (when we are getting no-where) – For those who go into flight, we might need to encourage them to speak by suggesting something we think they are thinking or feeling, e.g. “I guess you think I’m being unfair…”, “I sense you are angry…”? Sometimes we do say something wrong. We all do, so it’s no harm to admit it (authentically), apologise and then move on. If we do not do this, then respect and trust are diminished. This act of saying sorry often breaks the emotional intensity that is building up (and sets a symbolic precedent – if we apologise and show we are fallible it allows them to do the same). Finally, if people doubt you, state your intent twice – once as a negative juxtaposed with its positive. For example “I don’t think ……. I do think……” or “I not trying to make you feel….. I want to make you feel…”. Often this can be a powerful way of eliciting/tapping into what they are really thinking/feeling e.g “The last thing I wanted to do was communicate that I don’t value your work. I think your work has been excellent…”. The negative is an attempt to address the other person’s thoughts/feelings. The positive is a re-statement of the shared purpose. Crucial conversations are highly charged emotionally (and emotions are contagious). So how do we stay out of emotion? The first step to controlling our emotions is to name it – is it anger? frustration? hurt? ashamed? (many of us are ‘emotionally illiterate’ – we need to hone our ability to distinguish different emotions). “He made me so angry!” is a common cry but in reality we choose to react in that way – it is ourselves who make us angry! Furthermore, even if we have experienced a negative emotion we also have the choice how we act. The key here is to manage the meaning (as it’s the meaning we put on the event (rather than the event itself) that creates the emotion. It’s often the case that when one first steps into this emotionally charged situation full of positive intent, the other person is not in the same space. They may be feeling hurt and so will often ‘fire’ out at us. When emotions (and words that wound) start flying around, then its easy to get ‘hooked’. To stop getting hooked there are three things we can do: 1) Keep focused on the end goal 2) Refuse to play the game (merely being aware that a game is ‘in play’ means you are less likely to get caught by it) 3) Avoid the sucker’s choice – we can often find ourselves in a situation where we think there are only two solutions – to shut up and let it go or to express ‘brutal’ honesty. The reality is both will fail. The latter because it causes the other person to close down all barriers – we will not get heard. There is a middle ground that needs to be walked. To help find that middle ground we need to ask ourselves a more empowering question like ‘How to …….. without ……..’ (by identifying what we do want and what we don’t want to happen as a consequence of raising it). So how do we speak honestly without offending (and risk closing them down?). It requires a mix of confidence (i.e the bravery to have the conversation in the first place); humility (to present it in a soft way, and to know that we do not know everything); and skill (to be able to stay in dialogue). –Tell your story (i.e the meaning you are making of these facts). –Encourage testing – The intent is to reach a shared meaning to the facts as a solid basis on which to agree next action steps. http://www.crucialconversations.com/sus has a simple questionnaire to help better understand our own style when under stress. What is key is to find a mutual objective that both sides agree to. If I want one thing (and you don’t) then it’s unlikely to be a successful conversation. Thus we need to spend time to find an area we both agree on (NB – do not expect to resolve all issues in one go). The key word in ‘mutual purpose’ is mutual – it’s not about one side’s agenda. – Recognize the purpose behind the strategy – It’s recommended to first examine our motives: What do I want for me? What do I want for them? and What do I want for us? We need to keep asking ‘Why?’ for both parties as this allows us to ladder up to a higher level purpose. Once the mutual purpose has been defined it acts as a ‘North star’ that we can keep going back-to at any point the conversation gets tricky. A manufacturing company had been on strike for months. One of the authors asked both sides to go into separate rooms and write down its goals for the company. When they came back and shared they were surprised to find out how close the two flip charts were. This allowed both parties to work closer together. – Invent a mutual purpose – If a mutual purpose is not easy to find, then one is required to move up to a a higher level. – Brainstorm new strategies – Thereafter its about finding mutual solutions. It’s critical to separate fact from opinion as they are very different. So first one states only what is irrefutable evidence – i.e. what seen or heard (and not the meaning created from it). A hotel receipt is fact – the husband having an affair is only opinion at this stage. Facts are a safe place to start as it’s a shared basis of agreement and less likely to be as stained in emotion as opinion is. If the conversation starts to drift off-track later on, always bring it back to areas of common agreement (e.g. facts and/or shared purpose). Having stated the facts (which one gains agreement on) one can then spell out the ‘story’ we and they created. The story is not the facts. Many stories can be produced from the same facts (depending on where we have come from in our past experiences). It is recommended to slowly pace into it as this is the area that is most likely to push the conversation off-track (so be high on sensory acuity when telling it). We then need to pause and allow the other side to put forward their story/meaning of the facts. Critical in this is to be open and listening actively to what they say as they may well bring new evidence that shifts your interpretation of the facts. We need to keep reminding ourselves that the story is distinct from the facts – that it is after all just a story. Thus we are presenting it as a hypothesis, so we do not want to present it with the vigour and certainty of facts. In such highly charged situations, it’s critical to discover the underlying meaning the other parties are making of the event in question (as it’s often the meaning not the event itself that triggers the emotional response). We need to listen hard to the words they use, as many are not ‘clean’ language but emotionally laden. For example “She scowled at me” is an interpretation of a facial expression (fact). The key is that there are other potential meanings (and hence other responses) that can be drawn from the same facts. Create different meanings and one shapes new behaviour. -Victim stories (It’s not my fault). -Helpless stories (There’s nothing else I can do). The key is to get the both parties to construct a bigger shared story. It is only when we have a shared meaning can we start to devise an action plan. Agree – i.e. find the areas that you do agree on (e.g. a shared purpose, facts etc), often people can be in violent agreement, with just 5-10% points of difference. Build – Our education system and culture raises us to be critical. So we are better at tearing things down than building up. Skilled negotiators use the principle of ‘Yes and…” This is especially useful if the other side has missed out a key part of the argument. Compare – We should not set up the other person’s point of view to be wrong, but just different. Often an opening statement like “I think I see things differently…” helps. We should then ask them to compare the two stories expressed (theirs and ours) and then invite them to compare the two to find points of commonality. Hopefully through a shared consensus, we can now explore options for improving the situation. Just because we have reached a point of shared meaning, it does not necessarily mean we will have a successful outcome. There are still a number of other pitfalls: 1) No decision gets made 2) The wrong decision gets made or 3) No action happens following the decision. To help overcome this, we need to decide how to decide – it’s about agreeing the ground rules of the debate before the debate. 1) Command – Where there is a clear authority figure who are empowered to make the final decision. Sometimes this can be outside forces (e.g. economic conditions or maybe even ‘head office’). Thus the onus is more on successful execution of the decision made by others. On other occasions we may pass the responsibility of decision making over to someone else (because we do not really care what the result is or maybe because we believe the nominated person will make a better decision). 2) Consult – Where a person vested with the power to make a decision first consults widely before making a decision. NB There is a difference between asking someones opinion and actually doing what they recommend (as there will always be different points of view expressed during consultation). 3) Vote – The democratic way where the most votes wins. 4) Consensus – where one seeks a position that everyone can sign up to. This can take a long time and lead to a sub-optimal compromised decision being agreed. 2) Who knows? – Who has the relevant expertise to help make a better quality decision?) Do not involve people who cannot add value. 3) Who must agree? – Who are the people who could block the implementation later on if not involved in the decision making now? 4) How many people must be involved? – Try to involve the fewest people possible. There is a phrase that ‘everybody’s business in nobody’s business’. Without specifically tying an action to a specific person (along with a time frame, a description of key deliverable and‘standards of success’) it runs the risk of not getting done. Time spent upfront gaining agreement and clarity is time saved later on. Finally there must be a planned follow-up (as to make some accountable, you need to give them a time and place to ‘account’). I found this book gave some really useful tips and new insights into how to handle these situations. It brings the process to life through use of everyday work and personal examples. That said I felt it was less structured a process than I wanted (I have taken the editorial license to try to pull it together into a more coherent structure). Furthermore I missed out on a few areas I know of from my NLP training. For example it’s critical to keep focused on behaviour and not drift up to identity level (as this is more likely to bring the ego into play). Furthermore, we need to help define where the issue lies (for example is it a lack of skills? A lack of capability? A lack of understanding over expectation? Or maybe a lack of valuing it as important? Only by defining the root cause can we start to work on a more effective solution). As often is the case with these types of books, it’s less the theory and more the practice that makes all the difference. Finally, this book assumes that 1) We have the right to change another person 2) We are right in the change we want them to shift to and 3) We can change another person. Let the debate rumble! Thank you for this summary on a critical area of relationships! This was an interesting and helpful book that offered advice on effectively engaging with people when “emotions run high, opinions vary, and the stakes are high”. Although the authors acroynms and tools were too numerous and long to be practical, nevertheless I walked away with some tips to better handle conflict and tough conversations. Wish I had read this years ago! Interesting criticism. As a facilitator for CC, one of the points I think the content does is let you know that you can’t change the other person, you can only change yourself. Curious as to what you see in the book that gets you to your conclusions? Best summary I could find online!